Uniflex offers a full training and installation service. our customer service team will ensure you are 100% confident with Uniflex. 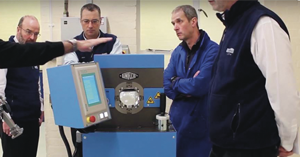 Training can be simply an hour to familiarise customers with controls, or a full day to cover the installation, basic usage of the machines, software training, production programming, service / data transfer and maintenance. Our sole mission is to provide the best service with the best machines. In addition through abdex we can offer a full range of BFPA courses for best practice with hose and fittings assembly. We have many endorsements however we never rest on our laurels. Uniflex promise you will never be disappointed!